Winter is fast approaching. And, with cold weather coming, the threat of fire increases. Why? Because folks want to stay warm and cold weather, and to stay warm usually requires use of extra heat to compensate for the extra cold. This increases the chance of fire. Taking extra precautions to prevent a fire can greatly decrease the chance of a fire breaking out. Don’t allow employees to use space heaters. Space heaters are notorious for causing unwanted fires. If, for some reason you do have to allow space heaters, make sure they are not used unless someone else is in the room with them. Also, educate your employees on how to use a space heater safely. Space heater should be used in an open area, not close to anything that could catch on fire. Limit the number of office extension cords/power strips being utilized at one time. Overloading power strips can ignite a fire. Also, make sure the extension cords/power strips are in good shape…no wires exposed. Make sure flammable materials are stored correctly, so that they are not near a heat source. Keep clutter out of public areas such as hallways. Have a designated smoking area for your employees and enforce the policy. 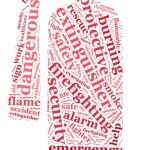 Your fire prevention equipment such as fire extinguishers and fire alarms should be well maintained. Fire Control Systems of Charlotte offers an array of portable fire extinguishers and fire alarm systems to keep commercial buildings safe. Fire Control Systems of Charlotte also offers the highest quality alarm systems to keep your business safe from fires and carbon monoxide poisoning. We also offer fire suppression systems as well to help keep commercial fires controlled should they break out.